The work of an art historian or curator can sometimes be like that of a master investigator or CIA agent. 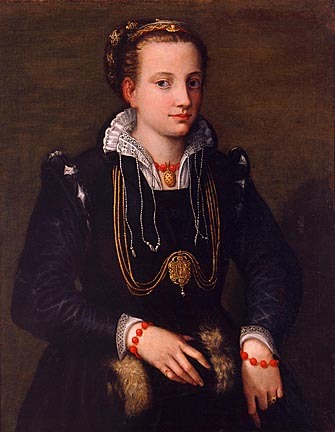 For example, a trail of clues led to the probable identification of the woman in this painting by Sofonisba Anguissola. Anguissola is one of the earliest identified female artists, working in Italy in the late 1500s. Rare for the Renaissance, Anguissola was famous in her own time and worked as the court painter for the King of Spain, a job she secured thanks to the portraits of her family that she’d painted as she grew up and honed her skills. The girl in this image is the spitting image of many of Anguissola’s family members, with her round face, large hooded eyes, and long nose. But Anguissola had five sisters and two brothers, so who is this? It was thought to be a self-portrait for some time, before an intrepid curator noticed the medallion at her neck, which shows a woman holding a spear and wearing a helmet, dressed in long, Grecian robes—attributes of none other than Athena, the Greek Goddess of war and wisdom. But the Anguissola clan, being Italian, would have known this deity better by her Roman name, Minerva—which also happens to be the name of Sofonisba’s younger sister. Mystery solved! Visit Minerva in Gallery 6 on the Main Level and take a closer look at the medallion yourself. This entry was posted in Art and tagged From the Collection, Renaissance, Sofonisba Anguissola. Bookmark the permalink. Hi Kathie! The retable is a Spanish altarpiece. At that time, most of the population that attended church couldn’t read, so these altarpieces often depicted a story from the Bible. In this case, we see the Annunciation (top two panels) and the story of St. Michael’s life (the other four panels). The Archangel Michael was the protective saint of Spain during their wars with the Moors, which makes sense, since the object is from Spain. I hope that overview helped, but if I didn’t answer your question, feel free to comment back and I will do my best to help you more! What do the arrows in that man’s eye mean? In one section, he is shooting himself. Hi Kathy, I’m guessing you are talking about the Retable of Saint Michael and Gargano. The arrow refers to part of the story of St. Michael depicted in the retable. I’m going to quote directly from our 1986 Guide to the Permanent Collection: “The narrative panels beneath the Annunciation depict, from upper left to lower right: Christ ordering St. Michael and his angels to battle; an arrow shot at the bull owned by Gargano because it refused to descend from a cafe on Mt. Gargano; St. Michael and his angels overpowering Satan; the arrow miraculously returning to pierce the archer’s eye; and the arrival of the Bishop to explain that the bull was sent by St. Michael himself to mark the site of a church to be dedicated to him” (22). I hope that helps!